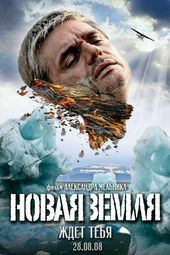 As a politicized Battle Royal, director Aleksander Melnik’s film Novaya Zemlya (aka Terra Nova) follows the murderous/survivalist exploits of a banished Russian/Chechen prison population. The opening sequence features paper angels, a nugatory steeple church teetering along a hellfire passage, a repositioning aircraft (! ), freakish Ferris wheels, mountainous cardboard imprisonments turned proscenium, a hatchet man and characters in varied stress positions. On its own the Boschian frame is compelling art. Its consuming narrative content will perhaps one day see it in an interactive museum. There is a monumentalization and a simplification of story in the depiction of Paradise and the mouth of Hell from which we’ve traveled. Art of the Title spoke with EDD KARGIN, a Moscow-based VFX producer/supervisor and owner of Sci-FX Studio responsible for the Novaya Zemlya opening title sequence as well as the film’s visual effects. Take us through your design process, from the early inspirations to the development process (presentations) and final execution. Did you set goals or is it more of an organic process for you? How critical are you with your ideas? When do you know when something is right? EK: Initially the opening title sequences were intended to be classical – the words on the picture. In the movie there were supposed to be animated insets (about 10 minutes in total), that’s why from the very beginning of the project we were working out the concept of the animation, but for lack of time, we had to refuse the animation during the movie. As a result of the work carried out we found a unique visual solution, and we felt sorry to throw it away. It was at this time we decided to use the creative power of these concepts in the opening title sequence of the movie. This was an excellent initial base. It was very important for the director of the movie, Aleksander Melnik, to make the audience perceive in a special way this complicated and original movie, and that’s why he set the principal goals essential for the realization of his vision to the art-director and the supervisor. It was necessary to select various settings for saturating and developing the initial style: scenes switching, composition and the objects’ breakdown in the space, dynamics and rate of camera movement, color-scale etc. From the director’s wishes every possible solution was considered and transformed. As a result of strong cooperation and the thorough creativity of our team, all raised questions were solved quickly and the titles’ production was an efficient process. How has your life and your former creative experiences informed this work? My experience as a supervisor comes from years of working as a TV designer, compositor and ЗD artist. I recognize the technologies and have been able to realize any suggested idea. What are some of your favorite title sequences & designers…anything people on this side of the planet might not be familiar with? My first inspiration came from the main title sequence for HBO’s Carnivàle. I very much like the sense of style of studios MK12 and PSYOP, especially if the work is done in 3D. In our country practically no one knows these companies. And the music video of The Prodigy’s “Spitfire” helped me to get the inspiration for the final stylization. We had little time for the work, that’s why for simplification and maximum flexibility of the pipeline we chose to work with a compositing program with plane 3D layers. There are no real 3D objects in the sequence. We built the world with plane layers. Nobody expected that the airplane would be so worked out in detail, it is virtually impossible to distinguish from models gathered in Maya. Well, the commercial failure of this movie was unexpected. Unfortunately the film turned out to be so turbid and gloomy that the audience couldn’t appreciate it. Tell me, who are the artists involved with what we’ve called the Boschian frame? How do you get inspired to render the dark pools of humanities’ conscience? Concept designer and art director Yuri Pronin (a former designer of the famous animation studio “Pilot”) was developing the concept-art for the animated insets. These pieces were supposed to show an imaginary place that was called “the third area” – an area for the lost souls between the heaven and the hell. As a result of working with the director’s screenplay an artistic base was found: characters and objects cut out from a sheet of paper, the surroundings must remind one of the stylistics of the Christian church icons (a few looking like Bosch’s style). The color scale is mainly difficult and gloomy; the texture – scratches, mud, rumpled dirty papers. The characters are deprived of humanity and are very rough. Afterward, Yuri adapted the created concepts to the title sequence and also prepared textures, backgrounds and other static art elements for the compositors and animators. What was the process for working with the production team? As an ex-TV designer and compositor I am well acquainted with the process of CG production inside and out, that’s why I can easily find a common language with CG designers, suggest the ideas, and correct the process as efficiently as possible. Also a very talented animator/compositor, Platon Infanta-Arana, was working on this project and we understood each other very well. What’s the most important thing you learned while creating this sequence? What is your favorite element of this sequence? The screenplay and the preproduction gave us main understanding of the movie’s concept. As a CG supervisor, I went through the shooting process and took part in the creation of the movie itself. It’s impossible to understand deeply the basis of style and temper of the story without this experience. During the production of the sequence the cooperation between the director and designers was very important. My main task was to seek out the artistic solutions necessary for the director and designers. The most important thing in my work was realizing the director’s thoughts and transforming them into a visual language to give the designers a clear direction of the work. It was a success. The director was pleased. In my opinion the best thing in this work is the combination of the various directions and forms into a complete style. I really like the final concept. Justin Cone, the editor of Motionographer.com and curator of 2009 year’s Promax/BDA State of Design show, will include our work in this special event as one of the cutting edge motion works from the past year. Our studio has been searching for the next project now. We are hoping for new and interesting challenges. We are waiting for new proposals!